STI down 38 points & closed at 3205 due to Stronger-than-expected Chinese growth data spurred concern about tighter monetary policy, prompting a sell-off in equities led by emerging markets. Osim, is one of the few stock that breaks above previous day high, this means that it is swimming against the tide(the overall market). That's why I think he deserve to be blogged tonight.. clap clap clap... Think about it, will retailer buy this stock today? When the market is so bearish? When the stocks is higher that yesterday's price? As it is having a ascending triangle pattern, can consider to enter when it breakout of the resistance(today's high) with volume. Mid-long term trade. SGX, As mentioned yesterday, this stock has broken out of the downtrend line. This means there is higher chance to go up than down. 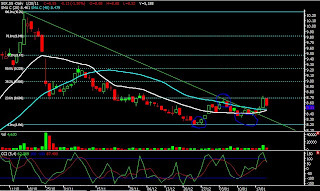 The stock has made a higher low(circle in blue) and a higher high. Why it is good time to get in now? 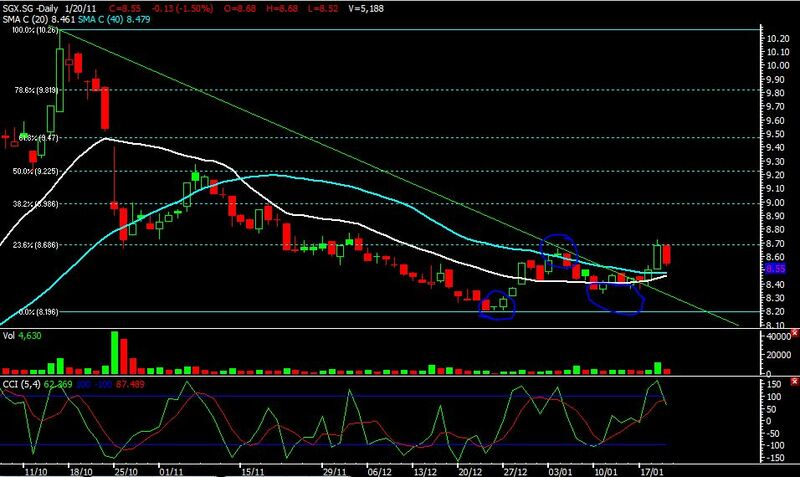 Now it will be supported by 20 and 40 ma, if it drop below this 2 line then will be ur cutloss point. Resistance will be seen at 8.70, 9.00 and 9.20. Mid to long term trade.